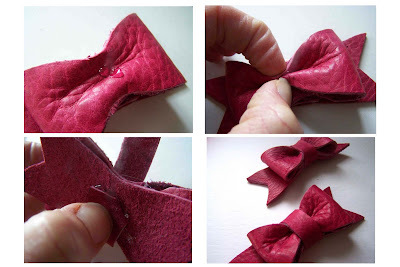 Today I'm going to show you how to make these cute leather bows. I have made several, in varied sizes, and think that they are quite adorable. These gwere inspired by this brightly colored leather that I recently procured while on a trip to a local saddle store. I am not a cowgirl, and to be quite frank, an not all that fond of horses (I've had some less than positive experiences with them). 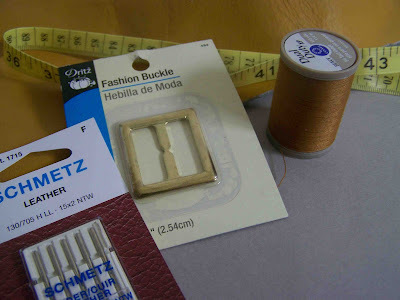 While enrolled in a book making class I discovered that saddle stores were the perfect place to buy remnant leather. They often have a box of scrap leather that is sold by the pound. On my last visit to the saddle store I found this bright pink, lilac, and mustard yellow leather. I was so excited, but I couldn't really imagine making a journal out of it. I bought it on impulse, and I am oh so glad that I did. 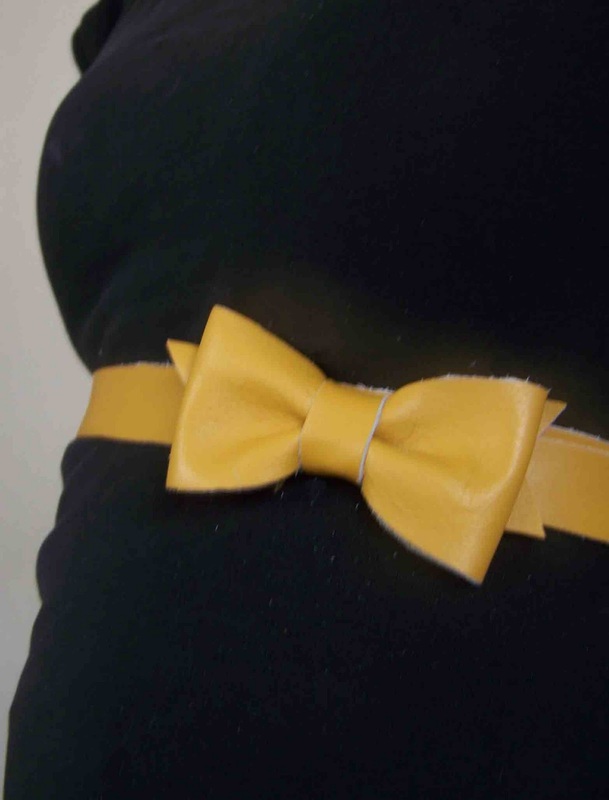 I am quite pleased with these little bows and belts that I created. Well I think that is about enough background information, lets get down to the nitty gritty. Click read more for the full tutorial. 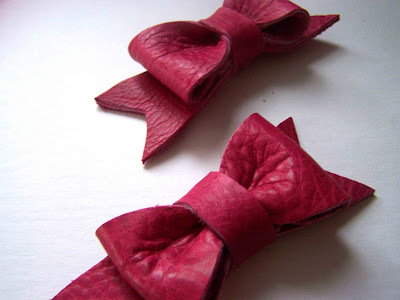 In order to make this particular style of bow you are going to want a leather that is quite soft and flexible. 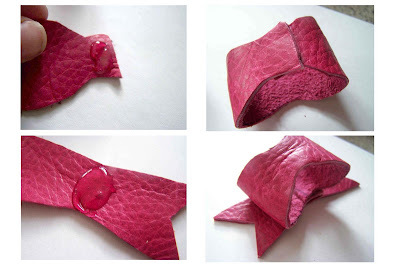 If you want it to gather in the center it needs to be quite worn, or relatively thin. 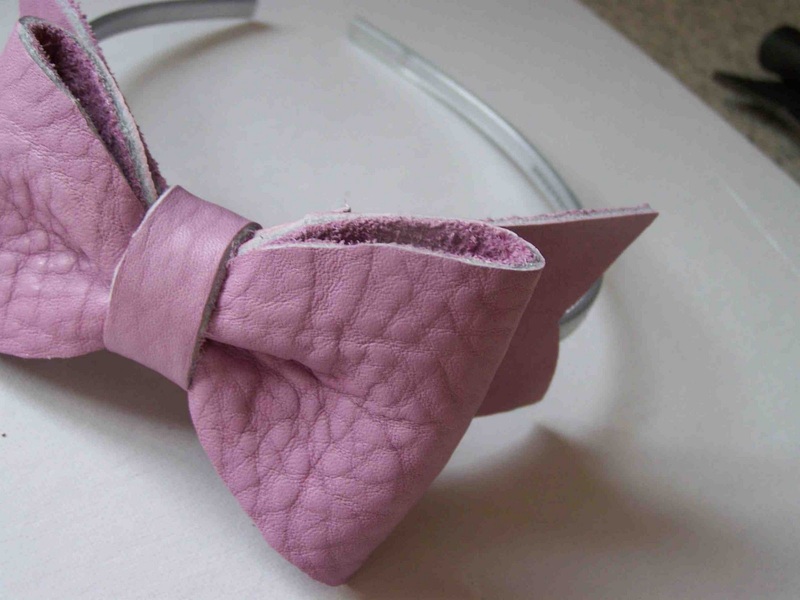 The lavender and pink leather that I used weren't very thin, but the leather was flexible enough that it worked. A thicker leather could work, but you won't get it to cinch up quite as much. The first step of the process will be cutting out your pieces (not shown). You will have three separate pieces: one for the tails, one for the main bow, and one center strip. 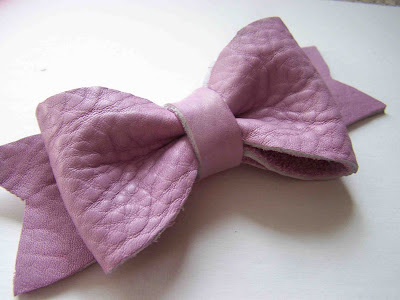 You can find the templates for the large bow (lavender) here, and the medium sized bow (pink) here. 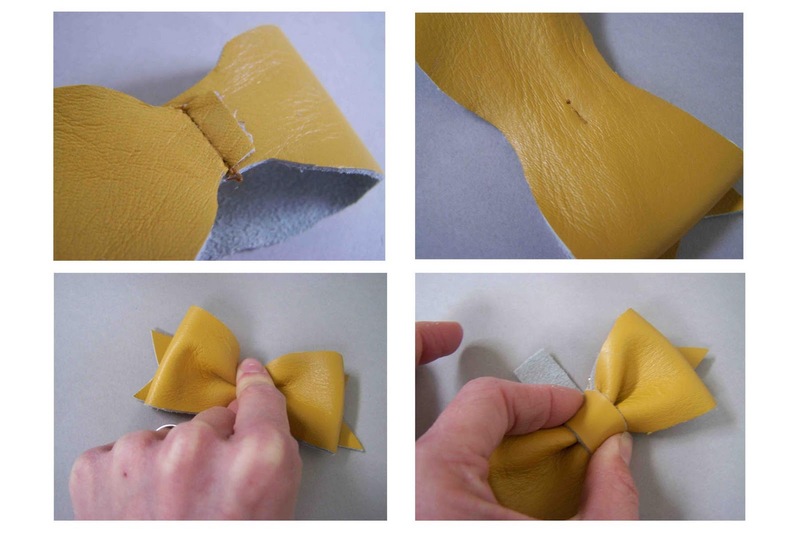 You can use a leather glue or a hot glue for adhering the bow. I didn't have any leather glue on hand, but hot glue did the job. Put a dot of hot glue on one end of the main bow (upper left). Place your remaining tab onto the hot glue (upper left), your main bow piece should form a loop. Place a dot of hot glue in the center of the bow tail piece (lower left). Place the main bow loop on top of the bow tail piece (lower right). Place a dot of hot glue on top of the center of your bow loop (upper left). Pinch together your bow center allowing the glue to adhere the gathers (upper right), the bow will not be fully adhered, but the glue will help the bow to remain gathered once center strip is attached. Put a dot of hot glue on the bottom of your bow tails. Stick one end (wrong side) of the strip to the dot of hot glue (bottom left). Tightly wrap the center strip around the body of the bow so that it snugly holds the bows gathers in place. Place a dot of hot glue on the bottom side of the strip to complete your loop. Ta Da....your bow is complete. Now all you have to do is decide how you want to wear it. I am planning on attaching the pink bows to some clips or bobby pins. The lavender bow I attached to a plastic headband. 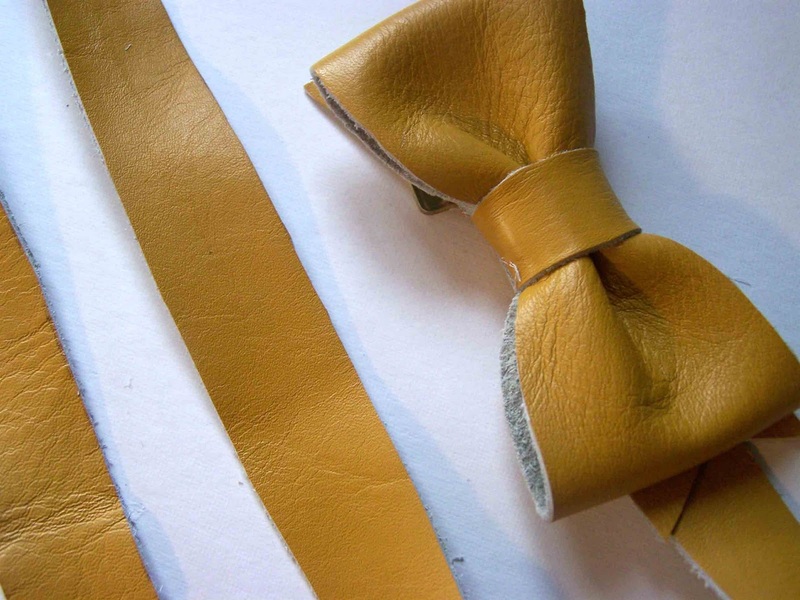 This medium sized yellow bow was attached to a 3/4" wide strip (16" long) of leather and some elastic to create this lovely little number. I also created a leather belt with the large bow template. The process was basically the same, but I did sew the leather in place, with exception to the center strip, to create the bow. Some of the supplies you'll need if you'd like to try this project are: a measuring tape, heavy duty thread, a fashion buckle or D rings, leather sewing needles, and some thin leather. Notice that I tacked down the bow and the tails with the sewing machine. The center strip was attached with hot glue. I'm linking up here. Thanks for reading. Your leather bows are just gorgeous! I love your photos and the different coloured bows. That belt is just so cool too. Such a great idea Tricia! I love the shape of these bows. Thanks for sharing the template! I need to find some leather and try these asap. These are awesome! And a tutorial, too?!? That is fantastic. Thank you! I LOVE it as the belt! SO cute!! This looks lovely and I'm eager to find a project to make with this. Only thing is, perhaps I'm just dense, but I didn't spot the actual template anywhere. Is it linked elsewhere? I posted your tutorial on my blog, hope you don't mind!! I love it!! Wonderful post. I really like it. Keep it up. Hi I just wanted to say Thank You! I have enoyed this pattern to make bows for my daughter & grandaughter. 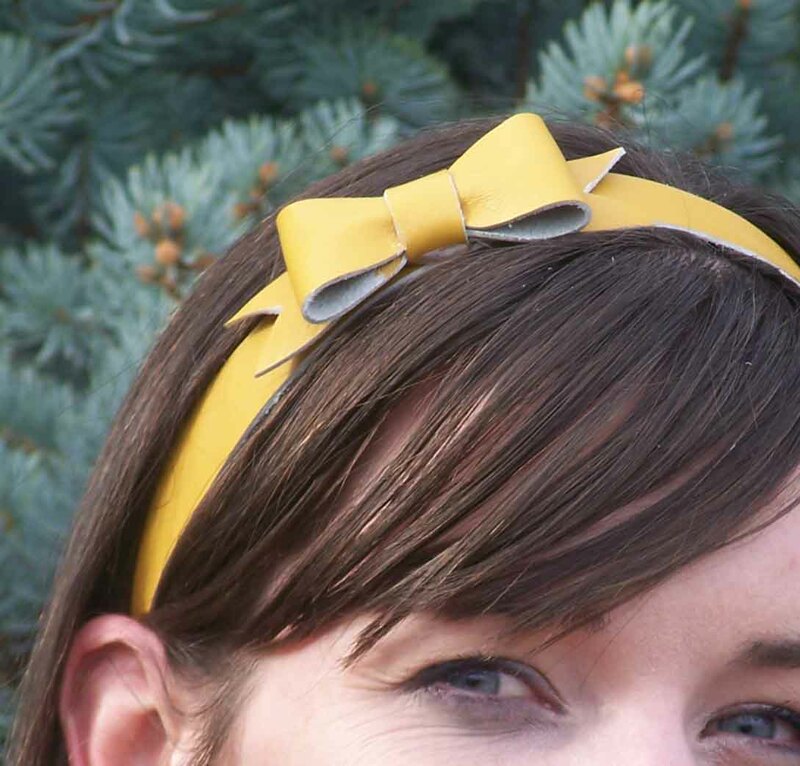 I also shared your bow on my blog today. i love this project...but can't find the template?